Toyota Kirloskar Motors has introduced a doorstep service programme called 'Service Express'. The service programme covers minor, medium, and major periodic maintenance and would be done within one hour. The company also offers wheel balancing, wheel alignment and an eco-car wash at the customer's doorstep. To add to the experience, Toyota will also offer car beautification services and minor body-paint work under the express service experience if required. 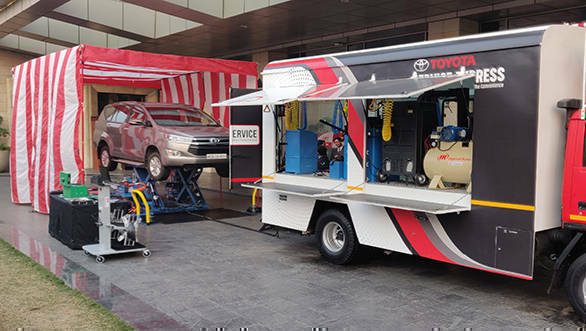 Toyota has a fleet of mobile service vans which are fully operational and focus to provide only select service offerings in terms of break down services and minor repairs. However, the 'Service Express' programme will offer the additional above mentioned services, which can be scheduled as per the customer's convenience and the maintenance can be carried out at his desired location, i.e home or office. These services have already been deployed in Rajasthan, where the company has received positive feedback. Toyota thus plans to expand the doorstep service network in a phased manner through its dealership network pan India under the 'Service Express' programme. Commenting on this new service offering, N. Raja, Deputy Managing Director - Toyota Kirloskar Motor, said, "Convenience plays a very important role towards providing delightful services and ensuring peace of mind to customers. At Toyota, we always listen to our customers' voice and strive to make our service offerings ever-better, providing ease access to Toyota's car care. Our aim is to limit the constraints of fixed location set-up of car servicing with 'Quick Service' offers at customers' doorsteps, bringing the best-in-class service experience even closer with these 'On-wheels' touchpoints. Through this service, we express gratitude to our loyal customers towards the trust and admiration they have shown through the years towards our products and services. Being a safety leader, it is our conscious effort to raise awareness on importance of regular maintenance of the cars to ensure safe driving experience. Through our world-class products and services, we continue to look forward to forging ever stronger bonds with our customers and partners," he added. Tags: Toyota | Toyota India | Kirloskar | Kirloskar Motors | toyota kirloskar | Toyota Servicing | Service programme | servicing | Toyota Fortuner | fortuner | innova | Toyota Innova | innova crysta | Touring Sport | etios | etios-liva | Innova servicing.